Making Sense of the Recent Past: Swami Prabhupada's Palace of Gold | Cultural Resource Analysts, Inc.
CRA recently completed a detailed evaluation of a unique historic property, the Palace of Gold, located in the community of New Vrindaban near Moundsville, West Virginia. The Palace of Gold is an elaborate temple complex that although built within the past 50 years is considered to be of exceptional historic significance and eligible for the National Register of Historic Places by the West Virginia State Historic Preservation Office. 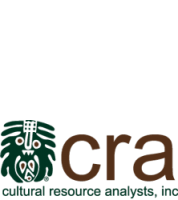 CRA completed a detailed history of the development of the Palace, defined its relationship to the surrounding properties and landscape features, assessed its historical significance, and established an appropriate historic property boundary. The Palace of Gold was developed by disciples of Swami Prabhupada, the founder of the International Society for Krishna Consciousness or ISKCON, popularly known as the Hare Krishna Movement. The members of the community planned and built the Palace of Gold between 1973 and 1980 by volunteers who worked largely without blueprints, developing architectural competence as they worked. The devotees operated a blacksmiths shop, marble cutting area, kilns and small scale workshops as they collected materials for the construction of the Palace. Once finished, the Palace became a pilgrimage destination, and new buildings and projects were undertaken to accommodate visitors, including the construction of guest houses, bathing ghats, large iconic statues, and construction of a guest lodge and restaurant near the temporary temple, all of which reflected the evolution of the New Vrindaban Community within ISKCON following the death of the founder. CRA found that the significance of the Palace of Gold for its association with the broad social and economic movements that were reshaping American society cannot adequately be discerned without the further passage of time. The widely varying, contested and very strongly held interpretations of meaning of the Palace of Gold and the institutional structures that led to its development demonstrate the wisdom of the 50-year threshold for the assessment of historical significance of the site under Criterion A and B, even though the architectural significance of the property has been documented. Indeed, the Palace of Gold, recognized as significant by the Society of Architectural Historians as a remarkable architectural achievement, derives its significance from its architectural characteristics as an important example of communally designed and constructed eclectic vernacular architecture built between 1973 and 1980. CRA’s staff of architectural and cultural historians has the requisite experience and expertise to identify and evaluate the full range of possible historic properties, including even the most challenging and controversial of architectural resources, Swami Prabhupada’s Palace of Gold.